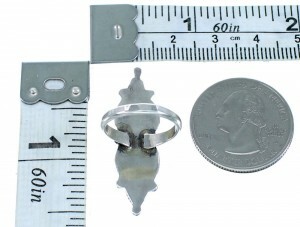 Ring is size 6-1/2, it measures approximately 1-3/8" long and 3/8" wide. 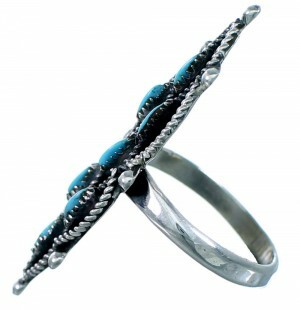 Excellent craftsmanship is shown throughout this amazing ring! 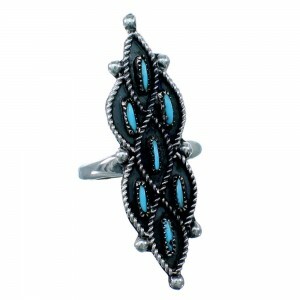 This piece of Native American jewelry is Zuni hand crafted by artist Lorna Mahkee, out of genuine sterling silver and real Turquoise needlepoint stones. A total of SEVEN stones are gently placed in hand cut bezel settings; while being highlighted with mini silver beads and twisted silver for an amazing finish.